This low budget indie made quite a splash at the 2004 Sundance Festival, and was well received the following year at the Festivals in LA and Seattle. Considering its budget, November is visually dazzling, but there’s much less here than meets the eye. When a director on a low budget film decides to compensate for lack of funds with dizzying camera tricks, editorial gimmickry, and story telling razzle-dazzle, the result is usually disappointing, and lovely-to-look-at though it is, November is no exception. Who exactly died here? Did he die? Did she die? Did they both die? Do I really care? This Lynchy, Shyamalanesque, neo-Roshomon attempt runs out of steam early on, and becomes unforgivably derivative and imitative. 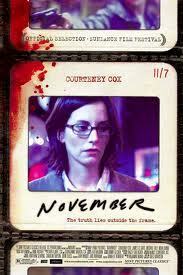 On the evening of November 7, photographer Sophie Jacobs (Courtney Cox, who does not change her facial expression once throughout the film) and her attorney boyfriend Hugh (James LeGros) go to dinner at a Chinese restaurant. As they travel home afterward, Sophie develops a craving for “something sweet” and stops their car at a convenience store. While Hugh is in the store buying some chocolate for Sophie, an armed man (Mathew Carey) arrives and holds up the store, shooting the store clerk, his son, and Hugh dead. He runs away as Sophie arrives. Sophie sinks into a deep depression, and cannot bring herself to erase Hugh’s voice from their apartment’s answering machine. She consults her psychiatrist, Dr. Fayn (Nora Dunn), about persistent headaches that she has been suffering from since his death. She tells Dr. Fayn that the headaches started to occur before the incident at the convenience store, and that she had been having an affair with a co-worker, Jesse (Michael Ealy). After Hugh’s death Sophie has dinner with her mother, Carol Jacobs (AnneArcher), who accidentally knocks a glass over. During a college photography class that she teaches, Sophie sets up a slide projector for the students to showcase their best photographs. One slide in the slide show depicts the exterior of the convenience store on the evening of November 7. Sophie contacts Officer Roberts (Nick Offerman), the head of the investigation into the shootings at the convenience store, who is as puzzled as she is as to who is responsible for the photos. Sophie’s headaches continue, and she begins to hear strange noises coming from within her apartment building and mysterious voices on the phone. Later, Officer Roberts discovers that the photo of the convenience store was paid for with Sophie’s credit card. Really, Greg? As each version of the story unfolds, the plot becomes almost laughably confusing, and ultimately unsatisfying. By the last shot, of the two lovers, hands extended toward one another in some cinematically sculpted mini-apocalypse, lying in pools of blood on the convenience store floor, I had long since stopped caring what had happened to whom, and why. Oddly, I both liked and hated this movie, and am glad to have seen it, if for no other reason than Nancy Schreiber’s hypnotic visuals. Shot on mini DV at 24 FPS, the ‘look’ of November is worth the time spent watching it. If only Greg Harrison knew how to tell a story. I was hooked 15 seconds into the credits, which are supered over a montage of breasts being squeezed and flattened onto mammogram plates at a radiology center, scored to the Roches’ hilarious and wise song, “No Shoes”, with its litany of self-mocking complaints, “I had no shoes and I complained/Until I met a man who had no feet.” Please Give is a wonderful example of movie-making on a budget, without resorting to gimmickry. The last words in “Please Give,” Nicole Holofcener’s latest comic drama of spiky manners, are “you’re welcome.” They’re uttered by Kate, a New York malcontent played with complex appeal by the wonderful actress Catherine Keener. Kate’s daughter, Abby (Sarah Steele), a stridently truculent teenager, has in a rare instance of filial generosity just thanked her mother for agreeing to pay for a pricey pair of jeans. From the near-beatific look on Kate’s face, it seems that after struggling to make amends for some vague, unarticulated wrong — by doling out cash to homeless people, for instance — she has found her moment of grace. Few American filmmakers create female characters as realistically funny, attractively imperfect and flat-out annoying as does Ms. Holofcener, whose features include “Friends With Money” and “Lovely & Amazing.” You may not love them, but you recognize their charms and frailties, their fears and hopes. They may remind you of your friends, your sisters or even yourself, which makes them attractive and sometimes off-putting, an unusual, complicated mix. We don’t necessarily or only go to the movies to see mirror versions of ourselves: we also want (or think we do) better, kinder, nobler, prettier and thinner images, idealized types and aspirational figures we can take pleasure in or laugh at in all their plastic unreality. The female characters in Ms. Holofcener’s films don’t live in those movies: they watch them. 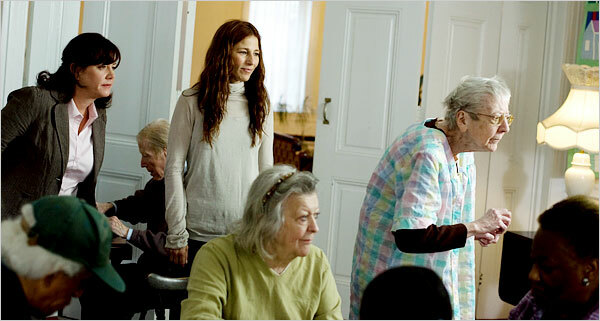 “Please Give” involves a cluster of such women, including Kate and her only child, the 15-year-old Abby, and their irascible next-door neighbor, Andra (Ann Guilbert), a nonagenarian with two granddaughters, Rebecca (Rebecca Hall) and Mary (Amanda Peet). Kate and her husband, Alex (Oliver Platt), expect to take over Andra’s apartment when she dies, a macabre objective that they compensate for with strained smiles and by running an occasional errand for her. Kate and Alex also own a store specializing in midcentury Modern furniture, lamps and the like, which they stock from the apartments of the dead. It stings when a customer calls them ambulance chasers, but there’s a touch of truth to that remark. Given how unpleasant Andra is, you can almost understand Kate and Alex’s impatience, though I don’t think that is exactly what Ms. Holofcener had in mind when she gave her characters so many thorns. Kate and Alex want to expand their already spacious Upper West Side apartment, a desire that slightly embarrasses them and creates tension, particularly during a birthday party that Kate gives for Andra. Mary, who comes with so many spikes she could star in a “Hellraiser” sequel (as Mrs. Pinhead), and has had too much to drink (as is her habit), urges Kate to explain her renovation plans to everyone, Andra included. It’s an uncomfortable exchange, but like too many scenes, it also feels rigged for maximum outrage. Most of Andra’s needs are met by Rebecca, who works as an X-ray technician taking mammograms. Ms. Holofcener doesn’t overdo the scenes of Rebecca tending to the patients, who might soon learn the worst. But the delicacy of Rebecca’s touch speaks a great deal about a woman who is also so depressed or repressed or something that she can’t even admit that she wants to see the leaves turn colors in the fall. What’s eating Rebecca? What isn’t? Certainly she doesn’t have it easy. Her mother died when she and Mary were young, and their dad soon headed out the door. (Maybe he was running from Andra.) Having been raised by her grandmother, Rebecca now buys Andra’s groceries and doles out her medications, living with Mary in a dreary, sterile apartment where they eat microwave dinners and watch television amid sisterly sniping. A sloppy, mean drinker with a quiver full of insults, Mary works in a spa and spends far too much time browning in a tanning bed — she looks like a Creamsicle. Neither sister seems to have any outside friends or, initially, a love life, which strikes a false note until you get to know them. Generationally, Abby, Mary and Andra embody the ages of woman — youth, adulthood and old age — a sort of variation on Gail Sheehy’s “Passages.” But because they’re so unmodulated, barely saying a kind word among them, they become tough to take. (Ms. Peet, nonetheless, keeps you watching and engaged.) The appeal of Ms. Holofcener’s films, which are visually unmemorable, rests almost entirely in her characters, so the lack of shading among these three throws the story off balance. Rebecca lacks a similar modulation until she meets a guy, Eugene (Thomas Ian Nicholas). Men might not make women happy here, but left to their own devices, women tend only to make one another unhappy. The more you get to know these women, the less time you want to spend with them — they’re so full of complaint that it feels as if Ms. Holofcener were worried about making them false, turning them into movie characters. The exception is Kate, because she comes with the most dimensions and is played by Ms. Keener (a Holofcener veteran). No one in American movies does difficult women better than Ms. 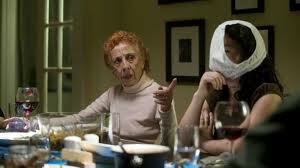 Keener, who’s fearless when it comes to nasty, cold roles, yet resists caricature. (At her most withering, she can recall George Sanders.) Her character in “Please Give” isn’t acerbic, but Kate has bite, along with a lot of underexamined — by her and by Ms. Holofcener — guilt, most of which appears to have something to do with being bourgeois. Kate’s habit of giving money to homeless people, along with the film’s title, suggests the scope of Ms. Holofcener’s intentions. There’s so much hurt in the world, and Kate wants to help. But she’s a rotten volunteer, weepy and self-conscious, and she doesn’t seem to see the pain closer to home. She’s the definition of the guilty white (presumed) liberal and might have been a rich source of comedy and pathos. But only if we saw her working through her issues (and her narcissism) with more obvious intelligence and greater self-awareness, wrestling more thoughtfully with life the way that Ms. Holofcener herself has tried to do in this likable if frustrating film. Ms. Holofcener didn’t need to come up with answers for Kate — the ones in the movie are less than satisfying — but it would have been nice if she had let Kate ask some harder questions. That said, I really liked this movie. This entry was posted on July 14, 2011 by shauncostello. It was filed under Fiction and non-fiction from Shaun Costello and was tagged with Catherine Keener, Courtney Cox, Nicole Holofcener, November, Oliver Pratt, Please Give, Shaun Costello, Shaun Costello's Blog.